Renovation & Handyman Services - Megibow Construction, Inc.
We are THE Professional Leaders for Residential & Commercial Renovation and Repair Projects. Megibow Construction is a family-owned and operated company that serves the Palm Beaches with over 30 years experience. We are a licensed and insured Florida State Certified Building Contractor. There is no need to make multiple calls and appointments for your home maintenance, renovation, or repair projects. Our company specializes in renovation and remodeling, handyman services, building repairs, maintenance and property management. Our team provides service for commercial and residential properties. We are well-versed with condominium association repairs, according to the Florida Statutes. Jason and his team always strive to provide a high level of attention and commitment to your project. Here at Megibow Construction, we believe when we do our job right, it doesn’t just improve your home’s value, it improves your quality of life. Our mission is to provide quality work, at a reasonable price, in a timely manner. Whether you are a homeowner or a commercial property owner, arranging for a visit with Megibow Construction is simple. With one call or text, an appointment will be scheduled for you. In 1987, Jason Megibow began his career in construction. He honed his skills as a carpenter, in Boca Raton, building single family homes. Over the years he worked for several construction companies. He spent those years mastering many trades in all phases of construction. Then, in 2007, Jason started Megibow Construction Inc. Over the years, he has built a reputation as an honest and skilled contractor. Now, he utilizes his extensive knowledge to offer his customers the best results. Reliable, licensed, and insured. We look forward to doing business with you. We are here to help you accomplish your best remodeling and renovation projects. Why do you need a Licensed Contractor for your project? I had a flood in my home. They were very helpful in negotiating with my insurance company, maximizing the amount I received, and were available to meet with the claims adjuster when they came to my home. They made this whole process less stressful for me during this difficult time. Thank you so much, you have been trustworthy, honest and dependable. You tried to save me money throughout the project, and have been a pleasure to do business with. I am still getting compliments on my kitchen design and workmanship. Big enough company to get the job done in a timely manner, and small enough to pay attention to every detail.We recommend them to all of our friends.We have been using Warren and Jason for years, they feel like family. It is a pleasure working with them because construction projects get stressful and they were always there with solutions in a timely matter, which took a lot of pressure off of us.They always have efficient, clean, and courteous people to get all of our jobs done. I am a property manager for a large property in Delray Beach, FL. 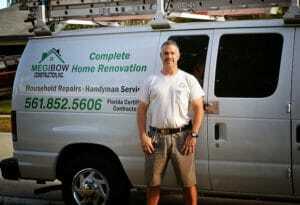 We use Megibow Construction for all of our building repairs, interior and exterior, large and small. We rely on them for leak detection, and mold removal. They are very familiar with Florida law and current building code, and they have been the only reliable contractors over the years. I feel safe with them in my home and even gave them the key to come and go as they needed. They take care of everything for me from changing lightbulbs, to remodeling my whole house.